Emily Kaplan is an elementary school teacher living in Boston. In this post, she writes about her experiences working at a no-excuses charter school, and raises the question about whether a relentless focus on academic achievement for even the youngest students is counterproductive. This first appeared on the Edushyster blog of Jennifer Berkshire. “I am a … scholar!” the 200 children chant. The principal weaves among the tables, making sure that the children “track” her by turning their heads in accordance with her movement. One child lets out a giggle. He is immediately sent to the Silent Area. Most mouth the words obediently: “Today is a step on my path toward success!” On cue, their little fists shoot into the air. These test scores don’t tell the whole story, of course, but they are also not meaningless. The school’s youngest students— children of color from predominantly low-income families— can do a lot. These 5-, 6-, and 7-year-olds who start each day by pumping their fists into the air while chanting about success are articulate in person and on the page; they are perspicacious readers and creative, rational mathematicians. Once children at this school reach adolescence, many struggle. Their high school entrance exam percentiles are far lower than those of their state standardized tests, and they are not admitted in large numbers to the most selective high schools. At the high schools they do attend, they struggle: in their first semester, 81% of last year’s 9th graders earned below a 3.0 grade point average. Existing evidence indicates that these students— who have spent their entire educational careers, from kindergarten onward, in classrooms named after four-year colleges, striving toward big long-term goals like “excellence” and “success” — aren’t graduating from college in large numbers. They aren’t excelling, and the extent to which they are even succeeding is debatable. So why is this? Why do some children who learn to read earlier than their peers do so poorly in ways that matter later on? Why do children for whom every aspect of their education, from kindergarten onward, is tailored toward graduating from college often struggle to graduate from college? Reflecting on my experiences teaching both at this school and at more traditional public schools, I find myself wondering if the methodology that enables young children to achieve so much so early actually hinders their long-term prospects. What if the struggles of graduates of “no excuses” schools reveal deficits that are not academic, but rather socio-emotional? What would happen if, instead of spending nine hours a day engaged in academic tasks determined by a teacher, children were to spend a large portion of their day developing “soft skills” that would enable them to overcome the hurdles they will encounter when they’re older? What if, like their suburban counterparts, they spent large portions of their day in rigorous, developmentally appropriate activities: learning to make friends, make art, and make believe, exploring and creating their interests and their identities? 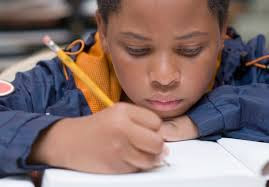 Pushing children to attain academic skills they will attain regardless— while depriving them of other, more developmentally appropriate activities that would enable them to succeed independently when they are older— is short-sighted at best. Implementing a more developmentally appropriate curriculum for young children might result in lower test scores in the short term, but I suspect that its long-term effects— both in terms of test scores and more relevant measures of success— would compensate. Maybe, though, letting small children linger in childhood would endow them with more of the real skills necessary to STAY FOCUSED ON ACHIEVING EXCELLENCE. Maybe, in the long run, it would better enable them to MAKE SMART CHOICES. Maybe my little neighbor, who pumped his fist in the air as he conflated success with recess, was on to something. Valerie Strauss covers education and runs The Answer Sheet.